As trusted spaces that people respect, museums and libraries are afforded the privilege and opportunity to introduce topics that visitors may not feel they have enough confidence or background knowledge to have on their own. They also have an opportunity to offer visitors representation. This is particularly crucial in children’s museums because so much of our aim is to help children dream big and feel empowered to pursue their individual interests and be themselves. It’s so important for people, especially children, to see representations of who Laverne Cox calls “Possibility Models”. Meet Erica. Photo Credit: Matthew Clowney. That’s the premise for the Trans Family Photo Gallery project. It’s an art exhibit for children featuring photographs of a family with a transgender grandparent. Photographer Matthew Clowney (matthewclowney.com) and I have been working with Erica Tobias, her children, and grandchildren to make an exhibit that celebrates the experiences of gender variant children and adults and inspires allies. It’s estimated that only 9% of Americans know someone who is transgender. Our hope is that visitors who see this exhibit will feel like they’ve gotten to know Erica and her family. We also hope that some visitors will recognize themselves or their own families in these images. 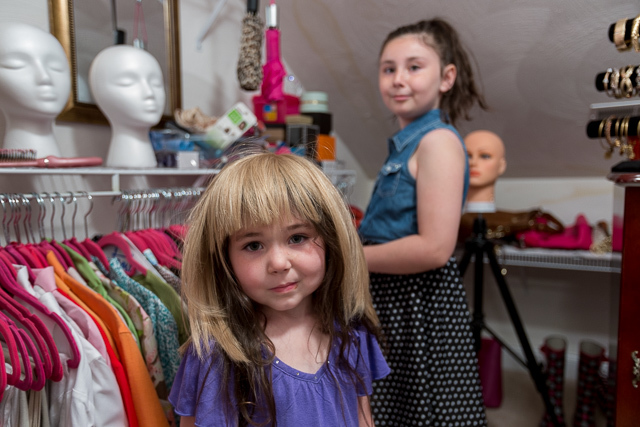 Two of Erica’s granddaughters playing dress-up in Erica’s walk-in closet. Photo Credit: Matthew Clowney. We didn’t want to perpetuate the harmful notion that there is one singular Transgender Experience, so we chose to focus on the experiences of one family instead of representing several families in the exhibit. 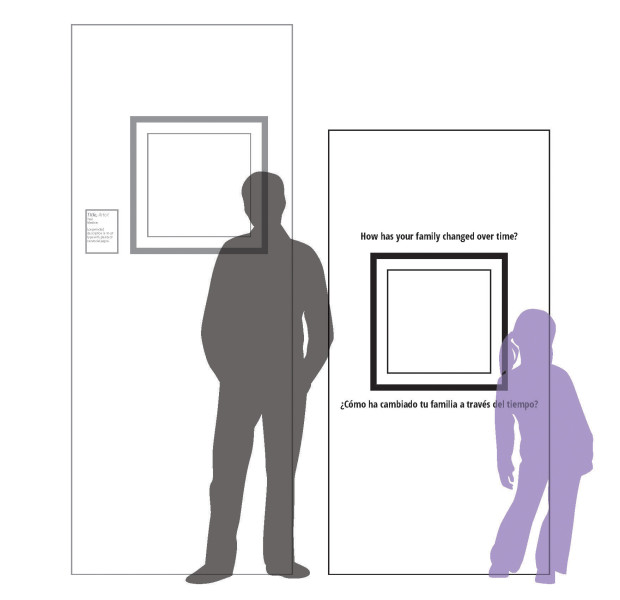 By making the exhibit a deeply personal window into the lives of a single family, we’re communicating to our audience that they’re viewing one family’s unique experience. And Matthew’s reportage-style images strike that personal note beautifully by capturing moments between family members that showcase their relationships with one another. Erica sharing a moment with two of her grandsons. Photo Credit: Matthew Clowney. Because dialogue is so important to successful family learning, we’re planning interpretation in the form of questions to spark conversation between family members. Questions like, “What traditions does your family have?” and “What does your family like to do together?” will help keep visitors’ dialogue focused on their own experiences. This technique was effective in another exhibit I worked on, American Family. Another element we’re borrowing from that exhibit is the sharing station, another opportunity for visitors to reflect on their own families’ unique qualities. There will be a table and chairs with paper and color pencils and a display space where visitors can share their responses to prompts like, “What does family mean to you?” “How has your family changed over time?” and “What makes your family special?” And for families who want to linger in the exhibit a little longer together, we’ll have a cozy book nook with a basket full of child-appropriate fiction and non-fiction books about family diversity and gender expression. Art exhibit for adults vs. art exhibit for children. The exhibit will debut at the Provincetown Library on Cape Cod for Family Equality Council’s Family Week, July 25-August 1. After its run in Provincetown, the exhibit will re-open at Boston Children’s Museum in October. We hope to travel the exhibit to other venues after that. That’s where our crowdfunding campaign comes in. We’re raising money to make a portable, robust version of our exhibit so it can withstand travel to multiple venues. There’s still time to contribute (HERE)! Our fundraising deadline is Wednesday, June 3. Margaret is the exhibit designer for Boston Children’s Museum. She is an artist and craftsperson with a passion for designing and creating playful learning environments. She writes the blog On Exhibit. I notice that the gallery-for-children-vs-gallery-for-adults image isn’t showing up, btw. You’re welcome Matthew! I re-uploaded the image and hopes it now loads properly, thanks for letting us know.